Discussion in 'News and Announcements' started by Roshen, Oct 7, 2015. 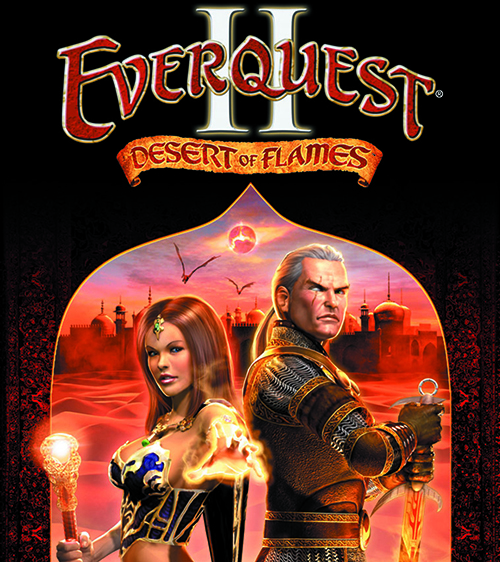 Are you ready to explore the first expansion, Desert of Flames, on the Time-Locked Expansion Servers? Players on both servers have voted to unlock this expansion, and this content will unlock on Stormhold and Deathtoll on Thursday, October 8, 2015! Both Stormhold and Deathtoll will have a short downtime starting at 7AM PDT on Thursday, October 8. We anticipate that this downtime will be less than one hour. Ability mod will become available on items and buffs. Guild Banks will now be available. Macro Voice Over’s will now be available. The Time-Locked Expansion (TLE) servers offer a unique EverQuest 2 experience different from our traditional servers. Are you unfamiliar with special servers like Stormhold and Deathtoll? You can get more information about what these servers are in the post here! how will we get there? bells like regular servers? will druid portal to SS work? probably bells, since i don't think they'll bring the carpet back. hopefully it'll be available from the cities but it might be a TS/Nek/etc network. Awesome! My guildies and I can't wait! So good to be getting out of the current version of original! Yay for content! “Are you ready to explore the first expansion, Desert of Flames, on the Time-Locked Expansion Servers? Players on both servers have voted to unlock this expansion, and this content will unlock on Stormhold and Deathtoll on Thursday, October 8, 2015! What about AE auto attack given by spells/buffs? Zerkers get a class defining spell this expansion with AE Auto Attack. Oh and casting speed for Death March. I would appreciate having casting speed on my monk buff as well. I won't hold my breath though. Is there still going to be the 65% cap on primary stats? What a f'in joke. Announce noon then change it to 7am last second. seriously?? None of my babies are ready to leave even Karan or D'Lere, much less venture to the island of Ro. BUT! I'm excited for the voice overs. My ratongas do not like being kept quiet. Wirewhisker and Jaden like this. Patches have been at 7 AM PST for about a decade now. So because berserkers get one attack the entire AE autoattack floodgate should be opened? Don't think so, ability mod is more than enough. Oh yeah! And potency for conjy pet's offensive stance! “Patches have been at 7 AM PST for about a decade now. I would like to see all classes be made available! They already made all races available. is something good too if you miss those 2 go on one of your friendly neighborhood regular server and pay them a visit, they be happy you came by. I am so happy we get a guild bank another step to making a guild a unit. We very much appreciate ability mod being added to gear, although casting speed is in dire need to be implemented. On priests and mage gear atleast. What about items? Ability mod will be more often on priest/mage gear or not? Or now we will see even more powerfull rangers/SKs/Conjies with a bunch of AM to nuke everyone out even faster?